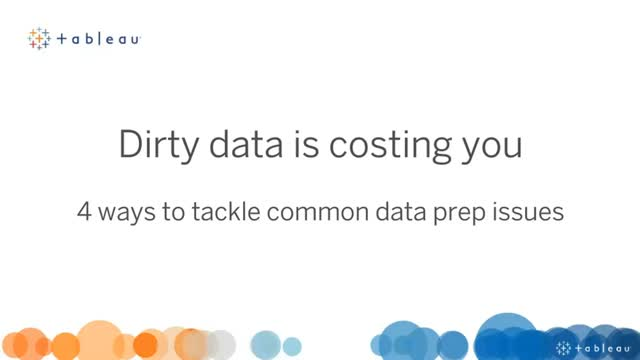 Overcome common data preparation issues and establish a company standard for "clean data". Get ready for this year’s big debate between hard-hitting data visualisation heavyweights Andy Kirk and Andy Cotgreave. They’re going head-to-head for five rounds to tackle some of the biggest issues in data visualization. And our special host for the debate is Amanda Hobbs, an expert infographics and data viz storyteller who will be keeping the Andy's on their toes. What's the best approach to practising data viz, do you need to do a full course or just open up your favourtive tool and get going? Does 'form follow function' or is it the other way around? The Andy's will discuss how familiarity, speed of recognition, cognitive overload, and your quadrant of needs determines whether to choose form or function. How not to abdicate your responsibilities as an analyst? If you need a sign, it’s bad design! Is every chart type useful and usable? Who said 'orange' represents good? Or is it blue? Find out what gets Andy Cotgreave's and Andy Kirk's blood boiling. In this webinar, Tableau's Technical Evangelism Director Andy Cotgreave will challenge the traditional definition of a dashboard. He will share his own definition and explain how the purpose of sharing data isn't to fit a particular definition, but to fulfill a goal. Andy will show many examples of different dashboards, explaining why they work and how they push the definition of the term "dashboard". Attend this webinar if you want to more effectively engage the users of your dashboards. If you love football or sports, this webinar is perfect for you! Join us as we take a look at how other users in the Tableau community used data to answer some of their curiosities about the sport. Leveraging on the World Cup season, we have gathered some of our users across Asia Pacific to share various examples of understanding the World Cups through data. We will also share our favourite vizzes across Tableau Public and discuss what more we can find out about the players and teams at the games.